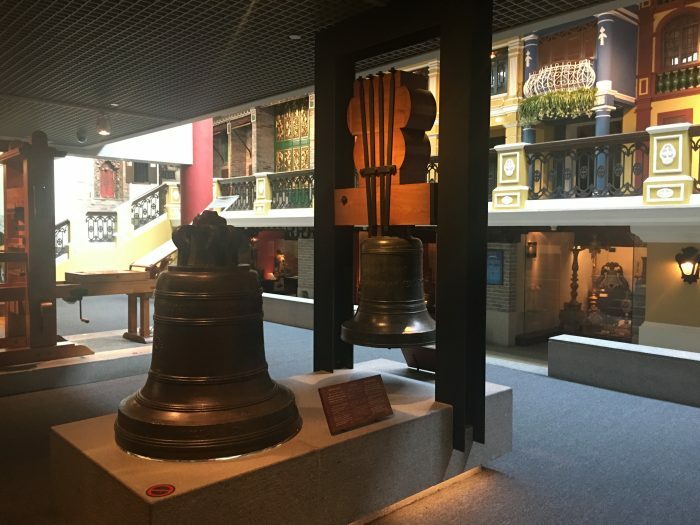 Although there are plenty of things to do in Hong Kong, there’s an entirely different experience to be had in Macau, which is just an hour or so away by ferry. 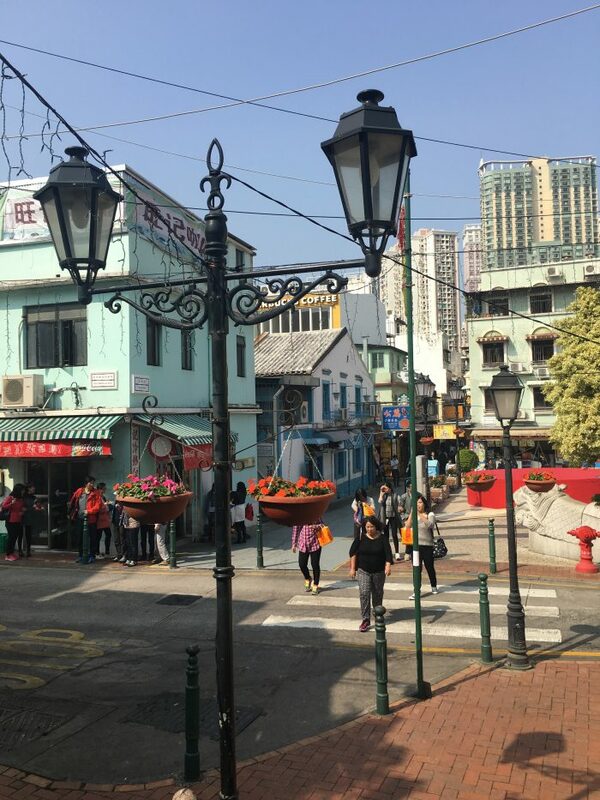 A day trip to Macau from Hong Kong is a unique experience if you’re looking to go somewhere different. 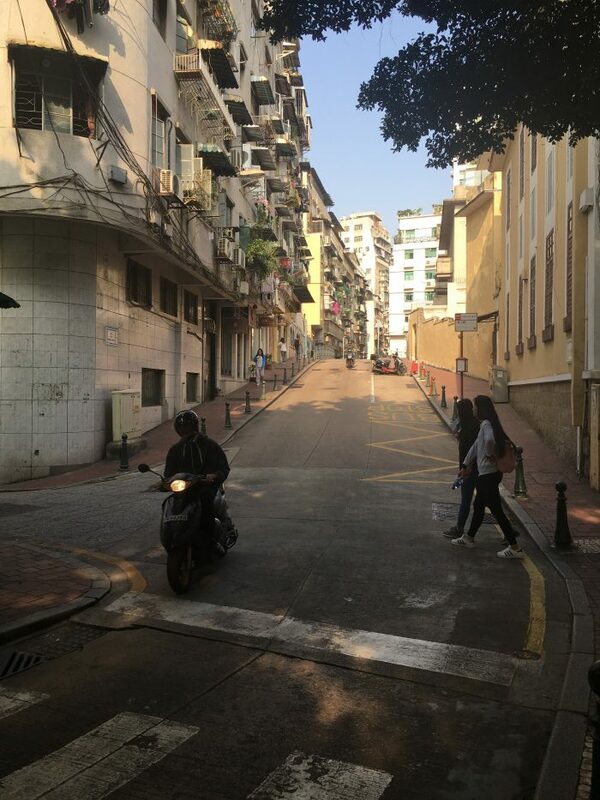 Like Hong Kong, Macau is a Special Administrative Region of the People’s Republic of China, meaning that while it does belong to China, it has a high amount of autonomy. While Hong Kong was ruled by the British, Macau was ruled the the Portuguese, allowing for a unique mixture of cultures found nowhere else. It makes for a great day trip from Hong Kong. From my hotel near Sai Ying Pun, I took the subway one stop to Sheung Wan, then from there it was a short walk to the ferry terminal. Ferries run every 15 minutes or so. 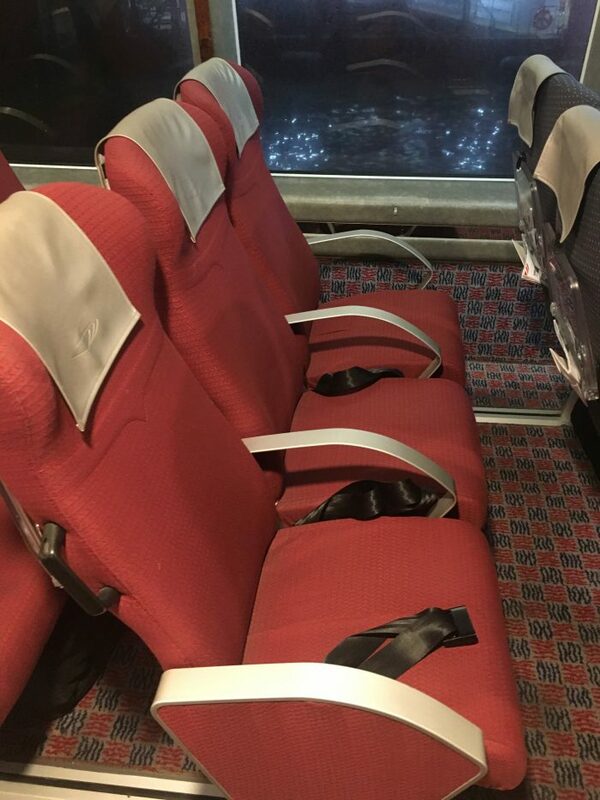 A one way Turbojet economy ticket was 164 HKD ($21 USD). Make sure you select the correct ticket at the kiosk to economy because the default was for a more expensive higher class. Unless you absolutely need to travel in luxury, save your money, since it’s only an hour journey. 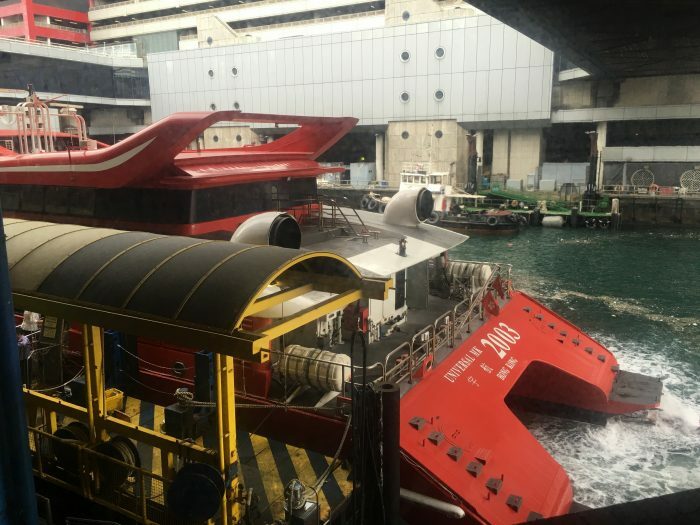 Seating on the ferry between Hong Kong and Macau is assigned, but not until you get to the gate area. If you get there early, you’re more likely to end up seated at a window, though if you’re like me, you still might have some guy try to convince you that he has the window seat. Seats are alphabetical like on an airplane, and the alphabet does not start with “B”, buddy. It also takes a bit to go through immigration, so plan ahead. It’s not quite a ferry that you can buy a ticket for and jump on a couple of minutes before departure. While I waited in the departure gate area, I had a pork bun & a chocolate donut for a snack. Boarding began, and it was a mob, even though seats were assigned. That said, if people are trying to ignore that, I can see why everyone would want to be on as quickly as possible. 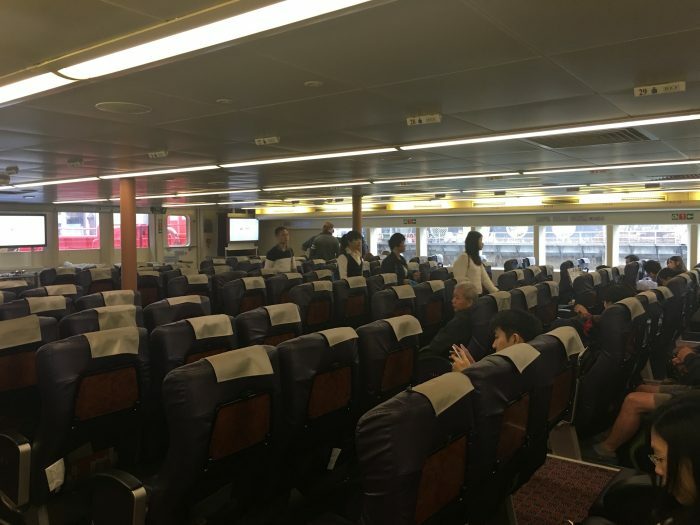 The seats on the ferry to Macau are nice and comfortable, not too dissimilar to domestic first class airplane seats. While the boat is in port, it rocks quite a lot, but once it’s up to speed the journey is smoother. The views of the surrounding islands of the Pearl River Delta were beautiful; the guy across the aisle who was clipping his fingernails was not. 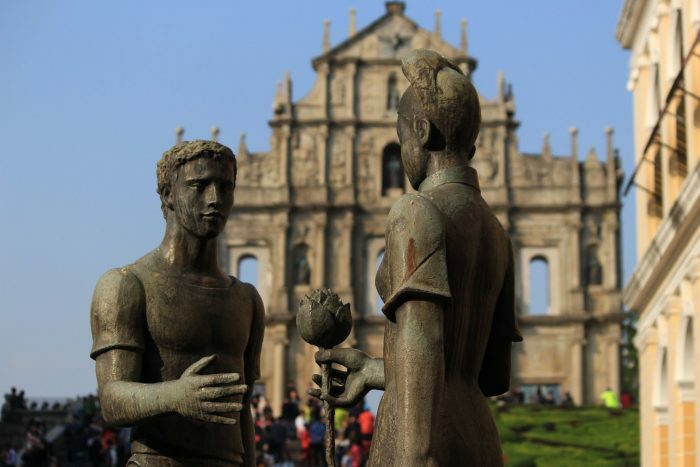 If you’re interested in taking a tour of Macao, check out these tours. After an hour, we arrived in Macau. Having done no research on how to get around, I stumbled upon a free way of traveling. 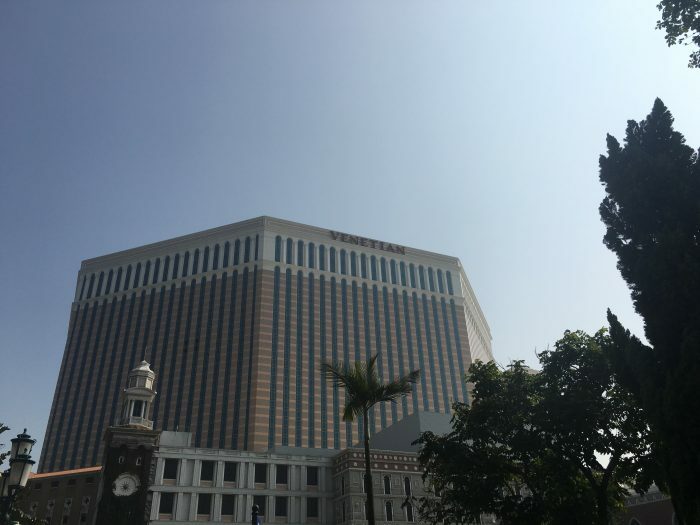 Macau is the world’s largest gambling center, with several massive casinos that make Las Vegas look like Reno in comparison. As such, these casinos, which are scattered around the islands, all compete to get people to visit. There is a bus station right next to the ferry terminal with free buses going to all of the different casinos. You can just hop on the bus to the casino that is closest to your destination, and ride there for free. The buses leave every 5-10 minutes. 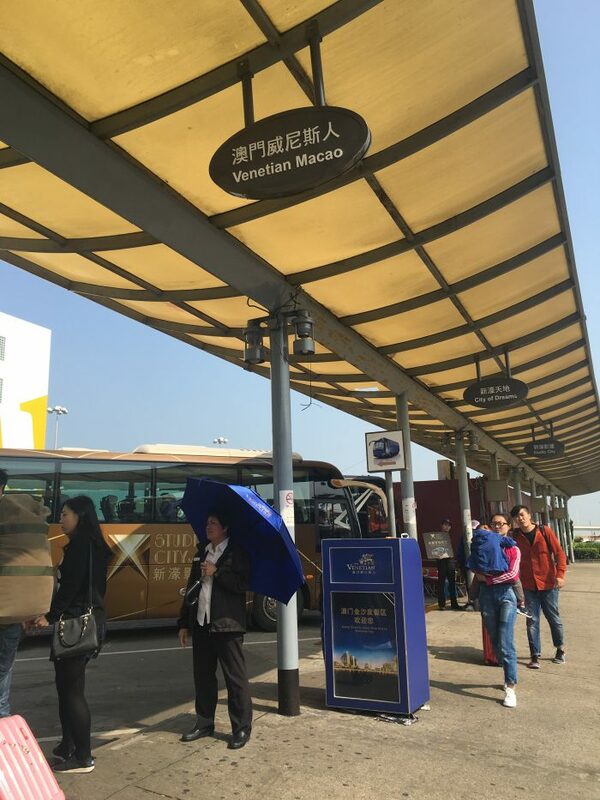 While the casino buses don’t cover every area of Macau, and their use requires doubling back to the ferry terminal if you want to go to a different part of Macau, it’s a great way to get around for free. 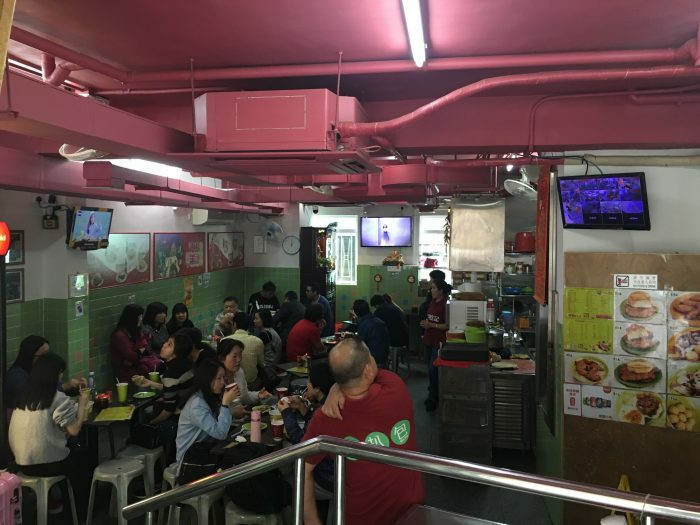 My first destination was the southern area of Macau, since there were a couple of food places I wanted to try, plus there are some historic Portuguese buildings there. 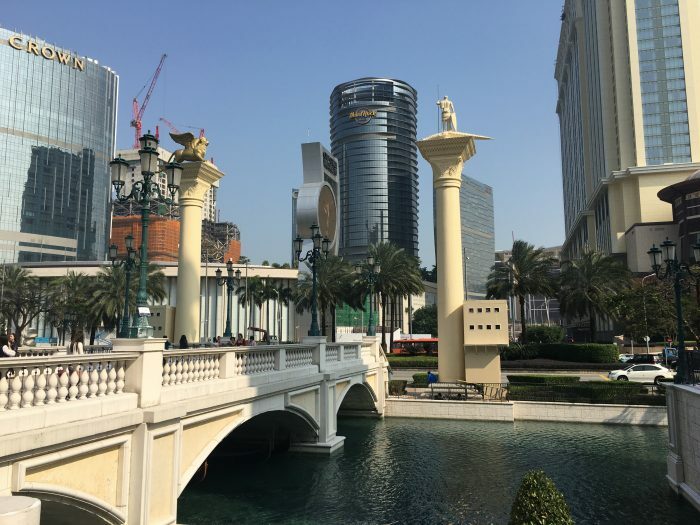 I took the bus to the Venetian casino on Cotain, an area of newly reclaimed land that hosts the largest casinos in Macau. I walked around the complex for a bit, which is the largest casino in the world. 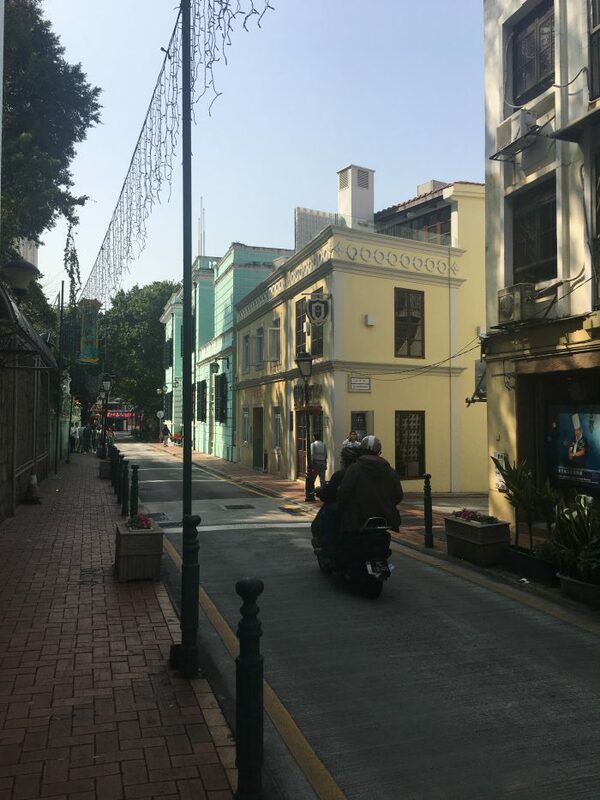 I was intimidated by all of the casino games I’d never seen before, so I then then walked toward Taipa, one of the older areas of Macau. These areas are a stark contrast to the massive, glistening megacasinos. Historic buildings line narrow brick & cobblestone streets, and it’s much more peaceful here. 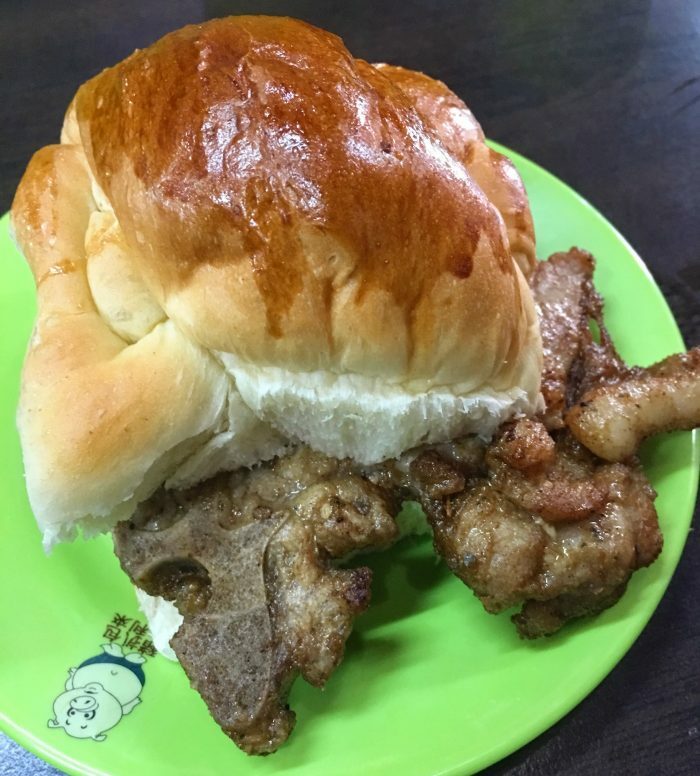 My first food stop was a hole-in-the-wall spot called Tai Lei Loi Kei. Tai Lei Loi Kei is famous for their pork chop buns. While there is an outlet in the Venetian, go to the original restaurant. 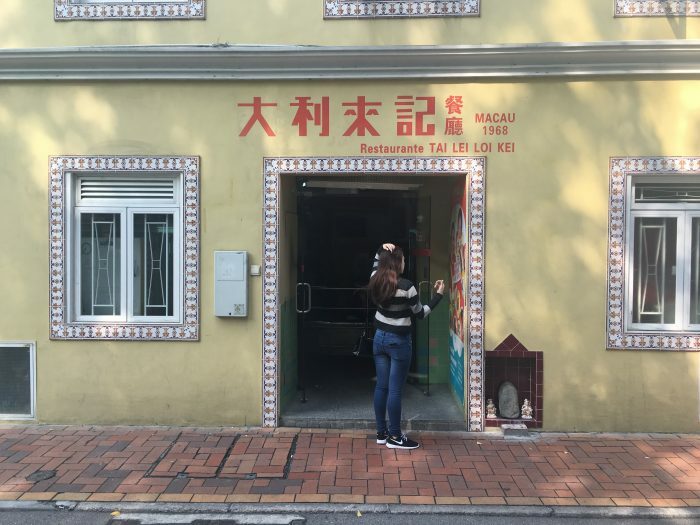 The walk through Taipa is worth it, and there’s always something nice about going to the source. It’s an awesome, simple sandwich. There’s just meat and bread, nothing else. Walking around more of Taipa, I passed shops selling tender jerky & had a couple of samples. Then it was time for dessert. 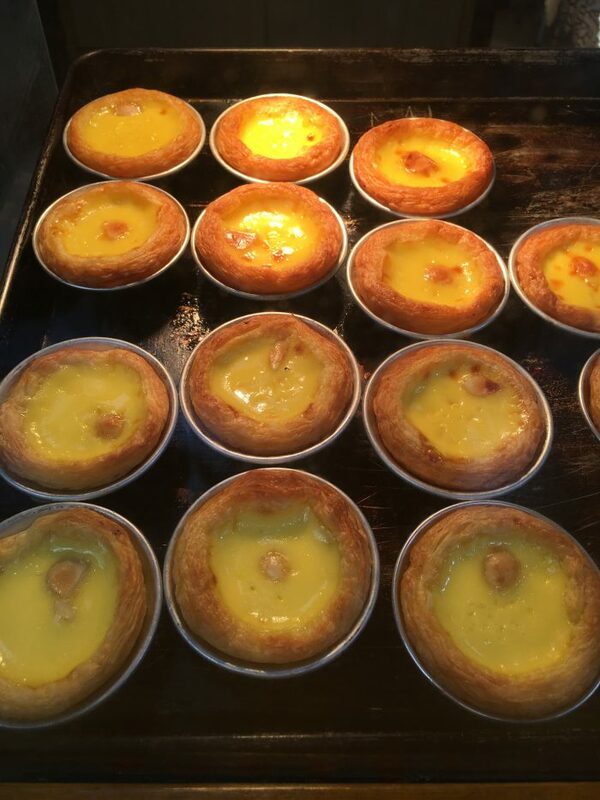 Macau is famous for their Portuguese egg tarts, so I had to have one. It was delicious. 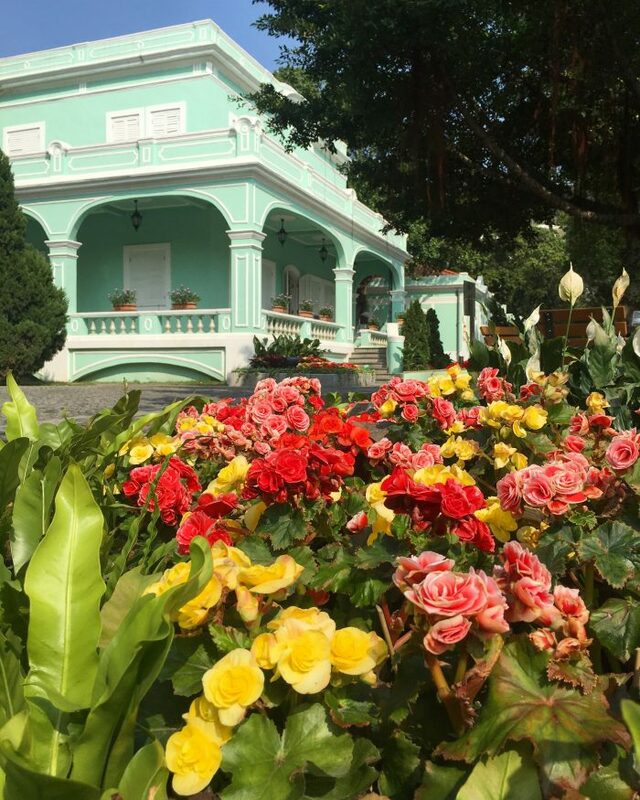 In addtion to the other historic architecture, the neighborhood is also home to the Taipa Houses Museum. While I didn’t go inside any of them, the exteriors are pretty. 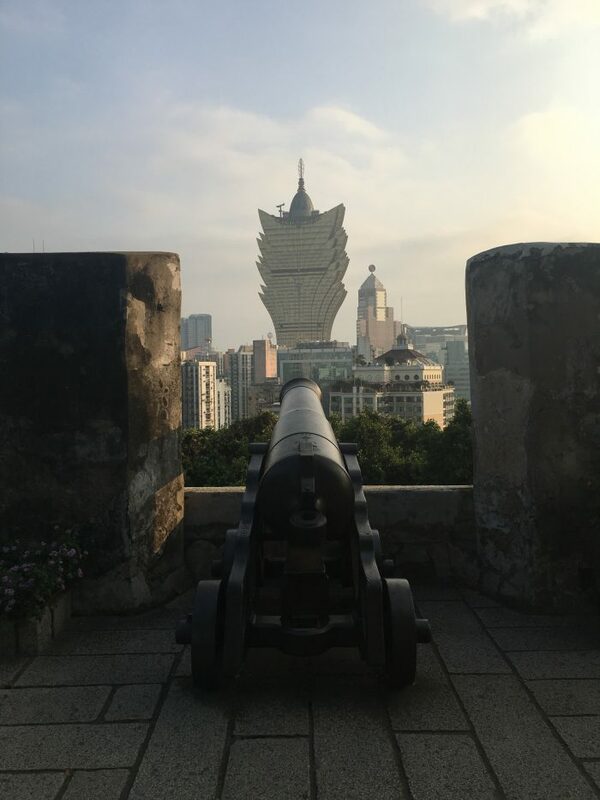 From there, I wanted to check out the central parishes of Macau, so I hopped on the casino bus back to the ferry building, then switched to another bus to the Grand Lisboa casino. The landfill & construction zones in Macau are astonishing. 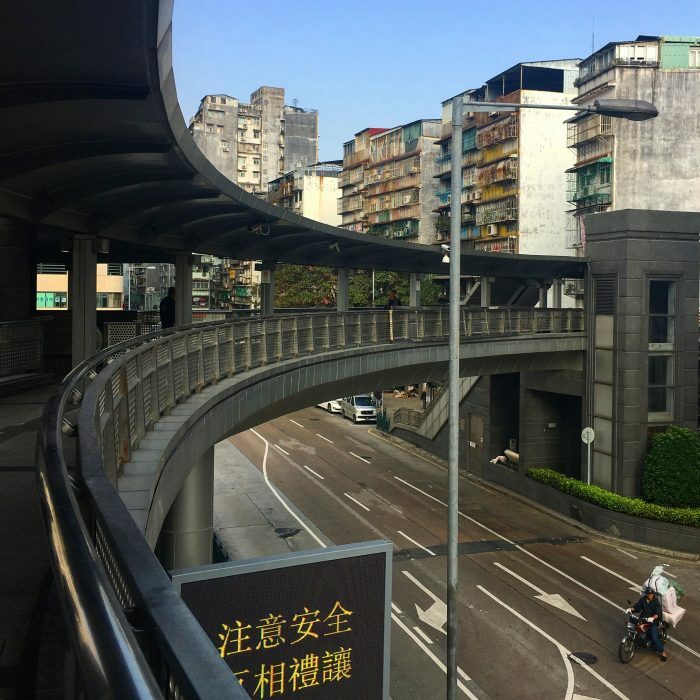 There’s a lot of money being spent here on infrastructure, including a local train system, and a bridge & tunnel system connecting Macau & Hong Kong. One can only figure that on a visit 5 or 10 years from now, one will return to a place that is virtually unrecognizable. Once again away from the casinos, the streets turn to a narrow jumble toward north & west. 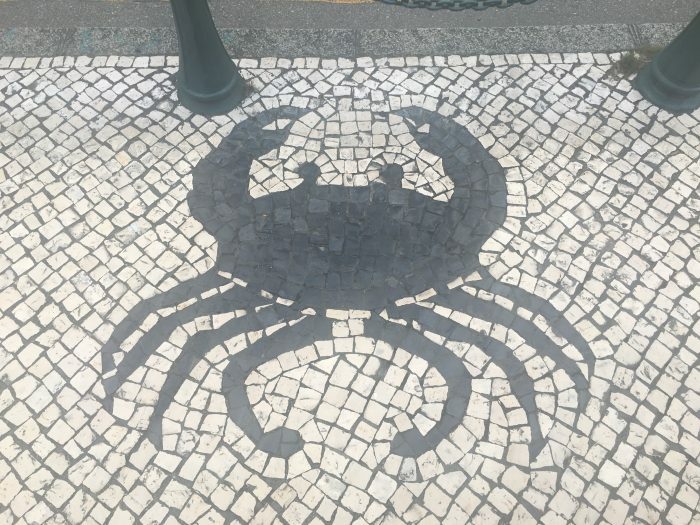 This part of Macau truly feels Portuguese. Without signs, you’d never think you were outside of Europe. 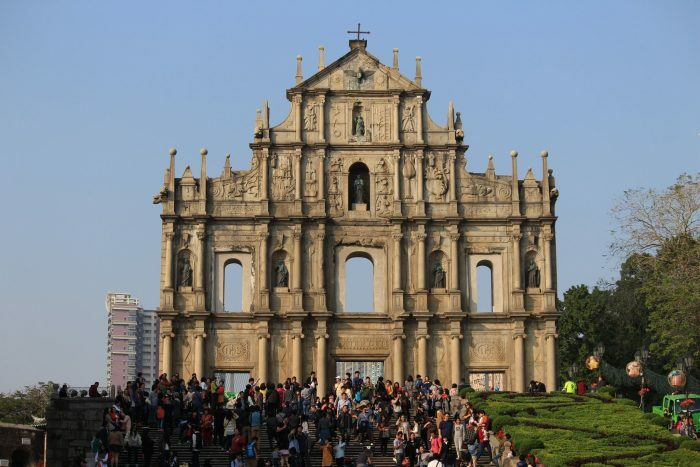 The historic center of Macau is a UNESCO World Heritage Site. I arrived at a Portuguese restaurant called A Lorcha that I had wanted to try, but unfortunately it had just closed. 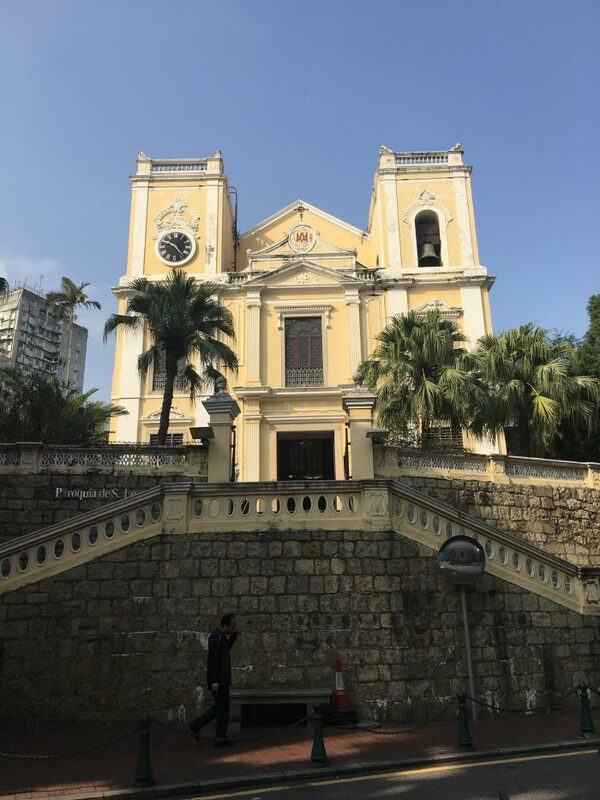 Instead, I headed north toward the Ruins of St. Paul’s, winding through even more alleyways through Macau’s shopping district, dodging scooters along the way. 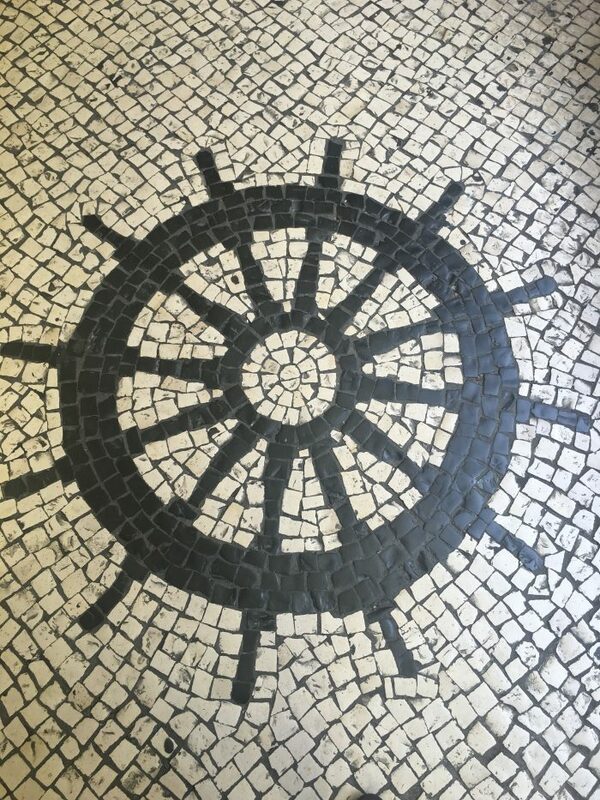 The tile sidewalks were particularly beautiful. I love ruined buildings, so seeing the Ruins of St. Paul’s was a treat. The church was built in the early 1600s, but burned down on January 26, 1835 during a typhoon. The remaining façade has been preserved, serving these days as a classic background for selfies in Macau. While most visitors stick to the view of the front from the steps, after walking beneath the archways, you can find the remaining foundation of the church, complete with crypt below. This area is also home to the Macau Museum. It’s not a huge museum, but it’s an interesting visit to learn some local history. There are artifacts and recreated houses. 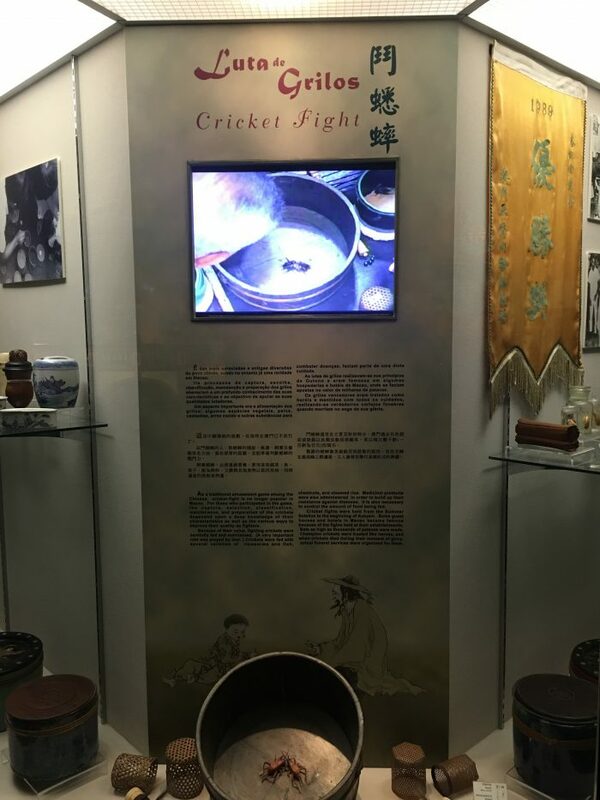 Exhibits range from colonial history to World War II to cricket fighting. 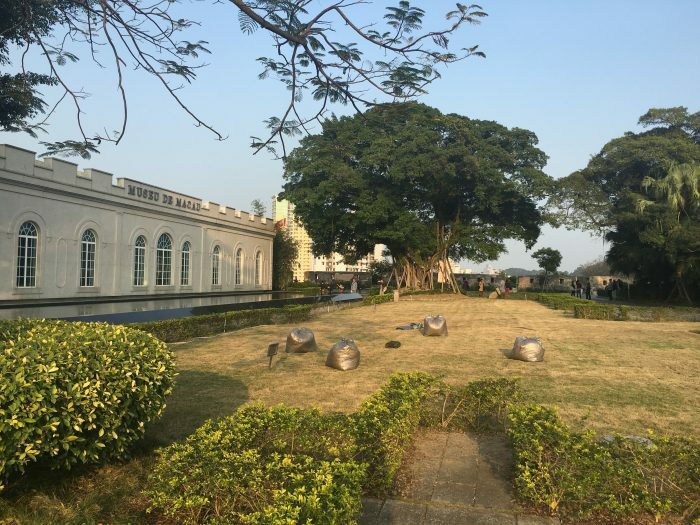 The Macau Museum exits out into a garden at the top of a fortress called Monte Fort. 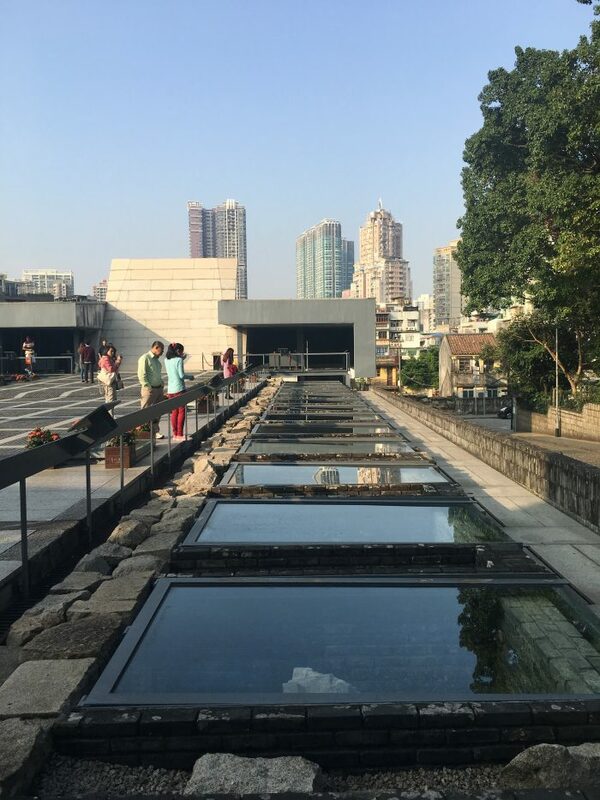 Even if you’re not interested in the museum, you can still utilize the escalators outside its entrance for an easier way up to the top. The view from Monte Fort is outstanding, featuring nearly 360 degree views around Macao. The only drawback is that by the late afternoon, pollution from mainland China had turned the skies to grey. Still, the fort is a nice place to relax & take in the views. After walking around a bit more through a couple of casinos, as well as unsuccessfully attempting to find a local Macao beer, I headed back to the ferry. The next ferry wasn’t for 45 minutes since it was later in the evening. This particular boat had less comfortable seats that were in sets of three near the windows, rather than two, also I got stuck with the aisle instead of a window. I didn’t get too nauseous, but if you’re prone to seasickness, a night ferry trip might not be recommended since it’s harder to find the horizon outside. 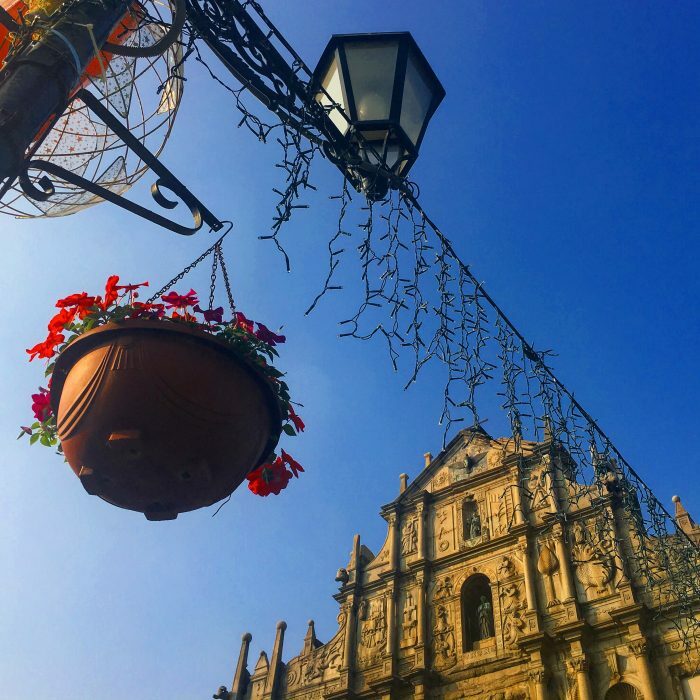 Macau is a great place for a day trip from Hong Kong. With frequent, fast ferries, it’s easy. You can easily see much of both old and new Macau in a day. 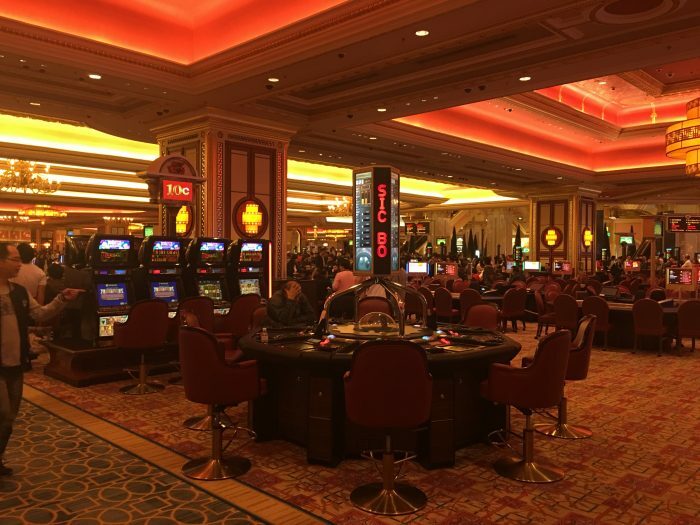 Even if gambling isn’t your thing, the opulence of the casinos is interesting to check out, especially in comparison to the slower paced historic areas. Next time, I’d like to stay overnight in Macau so I can see even more, rather than just doing a day trip to Macau from Hong Kong. Good report, it will help me on an upcoming trip.